Last week, I thought I understood quantum pseudo-telepathy. Then I tried to make sense of the details of the Wikipedia article, and realized I had no idea what was going on. This week, I understand well enough to explain it to a computer. Now we find out if I can explain it to humans. Pseudo-telepathy is a bit of a funny name. The idea is that you could fool a person into thinking you were a telepath by using quantum physics. You would do so, with a partner, by consistently winning a coordination game which has no classical consistently-winning strategy. Not all games benefit from quantum techniques (i.e. exhibit pseudo-telepathy). For example, suppose two isolated players are being told random words and must say “Same” when told the same word, and “Different” otherwise. Classical players can’t consistently win that game, and players using quantum physics do no better. On the other hand, if the players just have to say the same word, they can already consistently win using only classical physics (hint: just say “cat”). The simplest game that benefits from pseudo-telepathy is known as the Mermin-Peres magic square game. In that game each player is assigning 0s and 1s to cells on a 3×3 board while trying to satisfy some parity constraints. There’s a 3×3 grid, and two players (Alice and Bob). Alice and Bob each get two tokens, and are isolated from each other. A referee picks a row from the grid, and tells it to Alice. A referee picks a column from the grid, and tells it to Bob. Alice can either cover two cells of the indicated row with her tokens, or place no tokens. 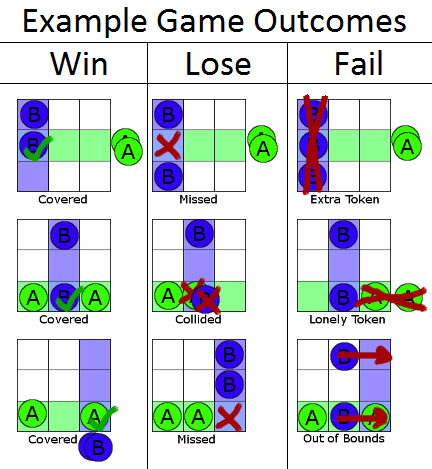 Bob has a similar choice: place no tokens, or cover two cells of the indicated column. They win if the cell common to the indicated row and column ends up covered by exactly one token. Let’s go through a run of the game. Suppose the referee(s) pick the top row and the right column. By herself, Alice is told the row and decides not to use her tokens. By himself, Bob is told the column, decides to use his tokens, and places one in the top row (of the right column) and one in the bottom row. They then get together and compare. The top right cell is the one they have in common. Alice didn’t place a token on it, but Bob did, so there’s exactly one token in the common cell. They won! You can check that the diagram of outcomes makes sense, given the rules. However, if you have access to quantum mechanics, you can win 100% of the time instead of only ~88% of the time. The last time I talked about quantum computing, explaining Grover’s Quantum Search Algorithm, I started from low level concepts and explained upward until we reached the solution. (It might be helpful to read or even re-read the Grover post first, but I’ll try to cover all the relevant concepts again here.) This time, I’m going to start by showing the solution and explaining downward. Allow me to break down the process that the above diagram is supposed to communicate. The diagram shows six quantum logic circuits, one for each row and one for each column. In the case shown, the referee(s) have picked the top row and the right column, so Alice has chosen the circuit corresponding to the top row and Bob has chosen the circuit corresponding to the right column. 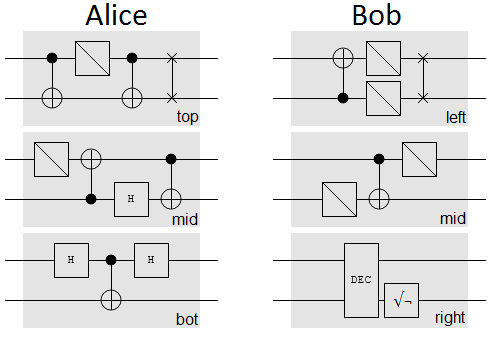 After Alice and Bob each run their respective entangled qubits through their chosen circuit, they measure both wires (they entangle themselves into the system). For each wire, they get an ‘On’ or ‘Off’ result. Alice and Bob use those outputs to decide on how to play their tokens. Alice’s top wire controls whether or not she places a token on the left-most cell of the indicated row. When the wire ends up On, she places a token. When it’s Off, she doesn’t place a token. She also does the same thing with her bottom wire, except it controls the center cell of the indicated row. She places a token in the remaining cell, the right-most one, if she already played one token but not the other. Bob’s wires control his moves in the same fashion, except he matches up his left wire with the top-most cell of the indicated column, his right wire with the center cell, and uses the bottom-most cell to ensure he played both tokens or neither token. It turns out that this strategy ensures they always win the game. Understanding why requires understanding the operation of a quantum circuit. As I explained in Grover’s Quantum Search Algorithm, a quantum circuit is made up of wires and gates. Each wire is a qubit. It’s a qubit, instead of a bit, because the wires can be placed into quantum superposition. A superposition pairs a complex number with every classical state the system can be in. The complex number associated with a state is called the state’s amplitude. When you measure a superposition, the probability of finding it in state S is equal to the squared magnitude of S’s amplitude. Superpositions are often represented using Bra-Ket notation, where states are placed between a pipe and an angle braket , and amplitudes are multiplied against the states. For example, if you measured the four wire superposition you’d always end up discovering the first wire being On, and the other three being Off. Conversely, if you measured the 2 wire superposition , you’d find each possible outcome occurring with 25% probability. Superpositions can also be represented as a raw complex vector. Of course, we need to decide on a mapping between each entry of the vector and the possible states. For our purposes, we’ll be interpreting as the binary number 1000 and so the ‘th entry of a 16-dimensional vector will correspond to the amplitude of the state . The other type of component, gates, represent operations to apply to the vector of states. Quantum operations must be linear, and must preserve the fact that probabilities add up to 100%. In other words, every gate must correspond to a unitary complex matrix. That’s pretty convenient: we can simulate operations by multiplying , where is the vector corresponding to the superposition of our wires and is the matrix corresponding to the gate to apply. Gates are where the phases of the amplitudes actually matter. Quantum gates can mix the components of a superposition, causing the various ways an output can be reached from an input to interfere. Whether this interference is destructive or constructive depends on the relative phases of the amplitudes. Now that you know gates correspond to matrices, I can tell you what each gate used in the solution does. Each symbol on a wire corresponds to a gate. There are six different gates shown, three that apply to one wire and three that apply to two wires. Notice how the blue superposition starts off as On, gets mixed into 50% On/Off, then gets unmixed back into On. The red superposition does the same thing, but with Off! This would obviously be kind of difficult to do with a classical circuit and one wire that carried only a single bit. The magic is in the phases of the intermediate state: they agree when the initial state was On and disagree when it was Off, and so the interference plays out differently when applying the second gate. These gates, as well as several others, are included in the Gates class of my implementation. The effect of two gates, one after the other, is equivalent to , where is the second gate’s matrix and is the first gate’s matrix. When gates apply to distinct wires, the order of and doesn’t matter. Note that when you want to apply a gate meant for one wire to a circuit that has two wires, you use the tensor product against an identity matrix to expand the gate’s equivalent matrix from 2×2 to 4×4. If the gate is supposed to apply to the first wire, the equivalent two-wire gate is , where is the 1-wire gate’s equivalent matrix and is the identity matrix. If the gate is supposed to apply to the second wire, then the equivalent gate is . The next section has an example of this. As you can see, I used the tensor product to adjust the Square Root of Not Gate to apply to the second wire out of two wires instead of just a single wire. Then I multiplied the resulting matrix against the Decrement Gate’s matrix. 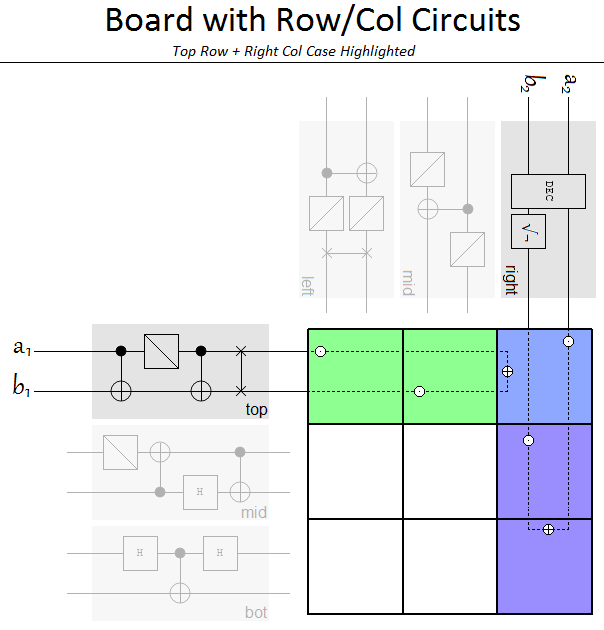 The resulting 4×4 matrix represents the circuit’s operation in its entirety. The PseudoTelepathyCircuits class of my implementation includes both the circuits and their equivalent matrices. I’ll include the matrices here as well, just to be nice. Note that, since it turns out that the phase of each row doesn’t matter (will explain), I’ve simplified them slightly by adjusting the row phases. In many ways, the matrices are simpler to work with than the circuits. I suppose now’s the time to point out that I didn’t actually start with the circuits and get the matrices from that. Things went the other way. First, I found the matrices. Finding the matrices was actually quite difficult. At the time, I was still confused how the heck the details of this pseudo-telepathy worked. I had no idea what the hell the Wikipedia article, as it was at the time of this writing, was trying to communicate by placing Pauli matrices into a 3×3 grid (fun fact: I still don’t). I started googling and reading the papers and articles Wikipedia cited, and reading the promising things those things cited. Eventually, I found the paper Quantum Pseudo-Telepathy by Gilles Brassard et al. It’s a review of games that exhibit pseudo-telepathy, and happens to include the matrices for the operations used by Alice and Bob (see Section 5.2). Once I had the matrices, I could hack together code to make sure they worked and tweak them to work with my game instead of the original Mermin-Peres magic square game. Now, in reality, quantum computers will not be able to just have gates for every arbitrary unitary matrix we can imagine. We’ll build them out of simpler gates. Circuits are also more concrete when it comes to diagramming things, so I wanted to find circuits made out of simple gates that ended up matching these matrices. First, I tried to build up these circuits by hand. Apparently I’m terrible at this because my circuits each used like 20 gates. Second, I wrote a program to brute force search for circuits that matched the matrices. That worked a lot better, using at most 6 gates per circuit. Finally, I realized that the phases of the rows don’t matter (you can multiply any row by or or without affecting whether or not the solution works). Weakening the constraints on the brute force search found the circuits I’m using in this article, each using at most 4 gates. Here’s links to the code that explores the space of circuits, and the code matching that space against the matrices. I’ve mentioned that Alice and Bob need two pairs of entangled bits to use as inputs to their circuits. This raises the question: how do they generate them? The above diagram shows a circuit. Its input must be the Off,Off state. The circuit then applies a Hadamard Gate to the first wire, uniformly randomizing it, and Xors the randomized first wire into the second wire with a Controlled Not Gate. Now the two wires are in a superposition containing every possibility where the wires are in the same state. More exactly, the system ends up in the superposition with each wire corresponding to an entangled qubit (called and respectively). The output of this circuit is the superposition . The top two qubits, and (which are not measured yet), go to Alice. The bottom two, and (did I stress not measuring them yet enough? ), go to Bob. We now have all the components we need in order to understand a full play-through of the game, although the why it wins part is still to come. The only thing left to realize is that, because the entangled qubits haven’t been measured, Alice and Bob are actually still part of the same circuit when they apply their individual circuits. The code in the PlayGame function of the PseudoTelepathy class essentially just simulates the above circuit and then measures the result. The question now is: given this circuit, what is the final state of the system? Initially, the system is in the state. Actually, I’m going to represent that as to cut down on the amount of text. 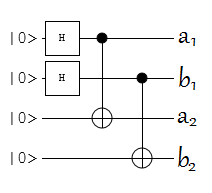 Then the two Hadamard and Controlled Not Gates are applied, creating two entangled qubits. This places the system into the state . Next the two top and bottom wires are fed to the isolated Bob and Alice respectively. This does not affect the state of the system. Penultimately, Bob and Alice each apply their circuits. It doesn’t matter what order this happens in (the operations commute because they apply to different wires). To represent the effect of the 2-wire circuits on the 4-wire system, we use the same trick for going from 1 wire to 2 wires: tensor product against the identity matrix. Actually, since , we can just tensor product their circuits together. The state of the system, after applying , is times . Finally, Alice and Bob will measure their parts of the system. They end up in each state shown in the above superposition with equal probability. For example, they could end up in which is for Alice and for Bob. Let’s see how the game plays out in this case. Since his high wire is On, Bob places a token in the the center cell of the indicated column (i.e. he covers the center left cell). Since his low wire is Off, he places no token in the top cell. Finally, he places a token on the the bottom left cell to correct the fact that he had an unpaired token. Alice places no tokens in her center or left-most cells, since her high and low wires are respectively Off, and since she placed no unpaired token she also places no token in her right-most cell. Hey, they just won! Bob placed a token on the common cell, the bottom left, and Alice didn’t. In fact, if you go through every possible case in the final superposition, they’re all winning results. If you’re really determined, and try playing on the other possible rows and columns, you’ll find that the same thing happens in every single case! I’ve obscured almost all of this matrix. Why? Because almost none of it matters to the result. Most columns are never used, and most rows don’t affect whether or not we have a winning solution. Note that the input to a circuit, in our case it’s the superposition over two pairs of entangled qubits, applies a scale factor to each column based on each state’s amplitude. The output superposition is then determined by summing across rows. Simplifying a bit, columns=inputs and rows=outputs. We know our circuit’s input is the superposition . This superposition only uses 4 of the 16 possible states (all the others have an amplitude of 0). That means all columns, except the four columns corresponding to the states in our input superposition, will be multiplied by zero. That’s why I’ve obscured them: they don’t affect the result. The remaining four columns all contribute equally. We also know that only some outputs correspond to losing. We don’t really care how we win, as long as we don’t lose. It’s fine if the amplitudes of winning outputs get scrambled, but the amplitudes of any losing output must be zero. Otherwise we don’t have a consistently winning strategy. So the obscured rows actually correspond to the winning outputs, which we don’t care about constraining, and the non-obscured rows are the losing outputs. Since we always use the same input, it’s always the same columns that matter: the 1st, 6th, 11th, and 16th. We can understand where these columns come from by analyzing what the tensor product does when combining Alice and Bob’s matrices. The 1st column is the tensor product of the 1st column of the matrix chosen by Alice and the 1st column of the matrix chosen by Bob. The 6th is the tensor product of the second columns, the 11th of the third columns, and the 16th of the fourth columns. 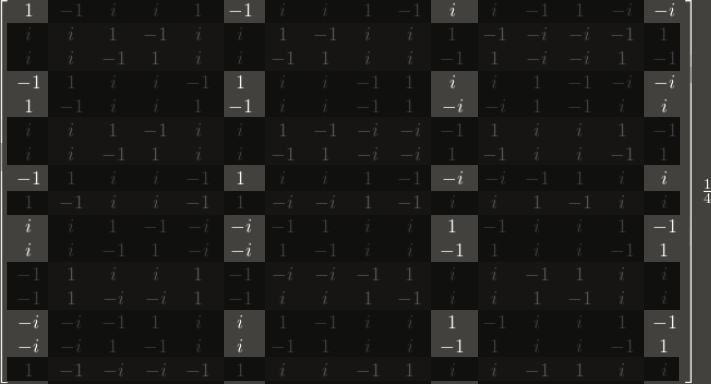 The important thing to realize about what I just said is that the columns that matter in the 16×16 matrix are generated entirely by pairing columns in the same position from the 4×4 matrices Alice and Bob use. That means summing across the columns that matter is actually just computing the dot product of an Alice row and a Bob row. That allows us to rewrite all our not-losing constraints into the form . Since we have 9 matrix combinations and 8 losing rows per combination, not losing gives us 72 equations that must be satisfied, over the 96 complex numbers making up our 6 matrices. Solving that system of equations (while also considering other constraints, like ‘must be unitary’) would allow us to find matrices that constituted a pseudo-telepathic solution to the game. The matrices I presented above are a particular example of a solution to the system. We’re actually done. All the information required to understand the solution has been stated. Implementing (a simulation of) the solution is just a matter of multiplying the initial vector against the correct matrices and confirming that the result only has amplitude in winning states. The matrices that correspond to the “winning” circuits have the property that they transform the initial entangled state in a way that gives no amplitude to losing states. That’s all there is to it. The game exhibits pseudo-telepathy because the system of constraints the matrices must satisfy is solvable when the matrices are unitary (i.e. you’re using quantum mechanics) but infeasible when the matrices are stochastic (i.e. classical physics). - Referee picks random row and col.
- Alice is told row and covers 0 or 2 cells in row with 'A' tokens. - Bob is told col and covers 0 or 2 cells in col with 'B' tokens. | Ref tells Alice the row and Bob the col.
| They each pick a circuit and run their qubits through. Update: This post had some errata. One of the controlled not gates had the wrong associated matrix. Half the circuits were wrong because I thought I could get away with not testing my matrix multiplication code. I've fixed the issues. Quantum pseudo-telepathy refers to the ability to consistently win games that can't be won consistently by players limited to classical physics. 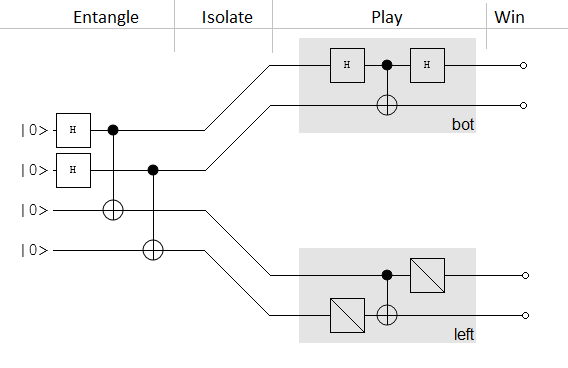 Strategies for these games can be understood as quantum logic circuits that involve entangled qubits, which can be thought of as being equivalent to unitary matrices. Winning can be thought of as constraints these matrices must satisfy. Classical strategies are limited to stochastic matrices, so sometimes they can't win consistently when quantum strategies can. I wrote code, available on github, that simulates the quantum circuits that solve the game I described in this post.